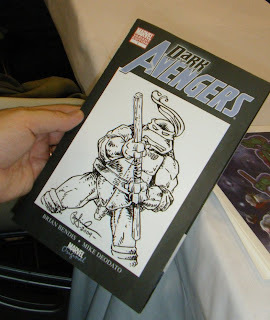 Remember that Donatello sketch I did at this year's NYCC to benefit the Inkwell Awards (I blogged about it a few days ago)? I must have copied it wrong, I got a this item doesn't exist invalid number thing. Gonna try again to see it. Good luck! I'm like you, saving for S.D., but I did give it a shot, then wimped out as I kept getting outbid. I want to bid on this so bad... But I'm holding out on the hope that Peter and the Mirage crew will be appearing at SDCC. There's no greater thrill than meeting an artist in person and then watching them sketch something for you! -->> ..will i get to see you this time around , DT ? ?